Just as we saw with the Marvel vs Capcom 3 final, the upsets continued this weekend at fighting game tournament EVO 2011, with Street Fighter "superstar" Daigo Umehara only able to finish fourth at this year's Super Street Fighter 4 Arcade Edition event. The winner of the weekend's signature event was Japan's Fuudo (using Fei Long, pictured), who beat out Latif (using Crimson Viper) to take the crown. This isn't the final. It's better than that. This is the top-8 match in which SF legend Daigo is taken apart by Poongko. 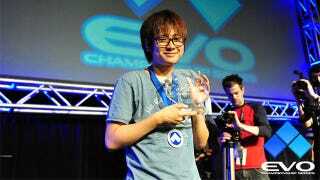 Fuudo Wins EVO 2011 Super Street Fighter 4 Arcade Edition Championship [SRK]</p?